I’m about to get a little personal here, so get ready. Ever since I was a little girl, I’ve suffered from cramps. Not minimal ones, not slightly annoying ones - harsh, persistent, unforgiving cramps. If you’re a woman who doesn’t get them, or a man, then let me paint a picture for you: Every day I had my period, I’d wake up feeling very heavy and groggy. Then, the pain would come, usually after I started to wake up more. It would hit me like a ton of bricks and it wouldn’t stop. It made my legs feel like lead and I could barely walk, let alone lie down, without pain. I had trouble finding a comfortable position no matter what I was doing, be it standing, walking, or sitting. On top of all this, I had stabbing pain in my womanly areas that literally deduced me to tears. It would cause me to have hot and cold flashes and literally made me feel like I wanted to throw up. Often times, I’d have to be force fed food just to take two advils (it’s bad to take them on an empty stomach), but just the sight of food made me want to puke. I also could barely catch my breath and often hyperventilated while asking the heavens “Why? Why me?” over and over again. This was my life. As you can imagine, this sort of pain kept me home a lot. I missed several days of class all throughout high school, and sometimes even in college. Thankfully, its gotten way more tolerable and mild as the years have gone by…but every once and a while, that same unbearable pain will tackle me to the ground and halt everything I’m doing, no matter what it is. It will literally put my life on hold. And I’m sick of it. I want out. I want an answer. I’m sick of being told “take advil”, “grin and bear it”, or “it’s part of being a woman”. You want pain that inhibits you every month? Thought so. It’s not normal, and I can’t, and never will, accept that as an answer. When period pain is that severe, there’s a reason. Your body, your hormones, are trying to tell you something. That’s why I decided to listen. That’s why I chose to try De Lune Care. De Lune Care isn’t a miracle potion, or a miracle cure. I don’t want you to think I’m saying all this because I want you to go, run out, and buy their product. Absolutely not. I’m saying this because I wanted to try something that would help me better regulate my period in a natural way. I’m tired of just managing it. I want to treat it. 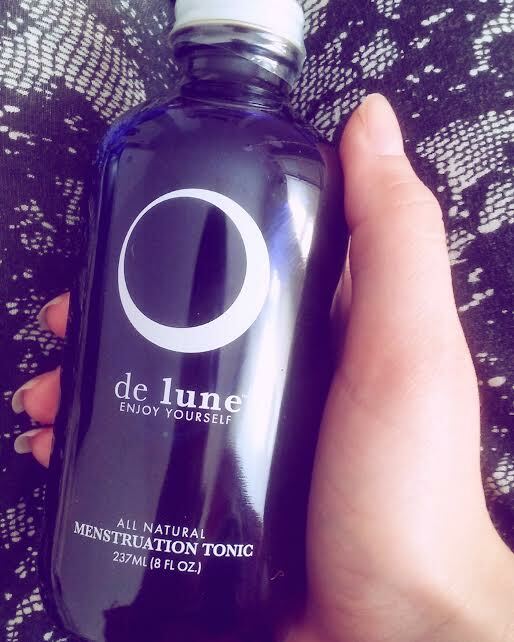 That’s where De Lune Care comes in: These tonics are specifically designed to make your period pain manageable. They’re made with all-natural ingredients you can actually pronounce and don’t have to worry about consuming. They come in a set of 4 for $20, which is not a bad deal at all. You’re supposed to drink one tonic per day as soon as you feel PMS of any sort. Since I usually sync my period to the moon, I’ve noticed PMS starts for me around the waning moon. I started drinking the tonics on November 13, and finished the 4-pack November 16, the day I actually got my period. Want to see what I thought of the tonics and if they worked for me? Here's my day to day documentation of the De Lune Care experience. De Lune is made with 5 simple ingredients: Water, organic apple cider vinegar, organic blackstrap molasses, organic raw honey, and vanilla extract. De Lune is packed with calcium, iron, potassium, magnesium, manganese, vitamin B6 and selenium. These powerful components have the ability to reduce period pain by easing the contractions of the uterine muscles, minimizing blood clots, and restoring essential nutrients. De Lune can be taken 1-2 times per day to help relieve PMS or period pain. It can be taken as soon as PMS acts up, or as soon as your period starts, depending on personal preference. De Lune Care was created in 2015 by Mimi and her partner Kai out of a mutual desire to addresses the cause of women's pain, not their symptoms. 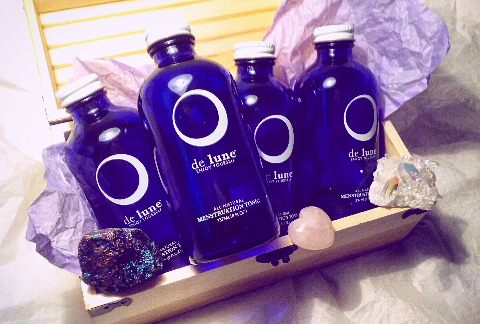 De Lune is a 4-pack menstruation tonic set that costs $20. With each purchase, you get 4 drinks (you cannot purchase only one drink). This was the first day I tried the tonic. Very clearly, the instructions say to drink 1-2 bottles as soon as I start to feel the onslaught of PMS. To be honest, I had felt some PMS a few days prior to this day, but I decided to wait until today because it was growing intolerable. I also didn't want to drink the tonic too early because I didn't want to waste any of it, considering there are only 4 bottles. When I took my first sip, I must admit I was shocked. I didn’t expect it to taste the way it did: It was kind of bitter and had a little bite to it. That’s because it’s made with apple cider vinegar – I thought it was apple juice at first glance. Silly me. Unfortunately, the first tonic was very hard for me to down because of this. I had expected it to be sweeter because I misread the ingredients (but it’s still safe and all-natural!). Because of that, it took me a while to finish the first bottle. In fact, I drank it in bursts throughout the day: A quarter here, a quarter there. My PMS wasn’t super terrible, but it was enough where I knew my period would be coming well within the next few days. I didn’t see an immediate result from finishing the tonic today, but now at least it’s in my system. Now that I know what the tonic tastes like, it’s a little easier to drink. I wouldn’t say it tastes awful, but it is an acquired taste. I started to taste the subtle notes of honey more today, which certainly made it more tolerable to drink. I'm starting to get used to the taste and actually enjoy it. As far as my PMS goes, the camps are on and off. Usually, the first couple of days I get PMS I get on and off cramps, start waking up feeling very heavy, and having intensely vivid dreams. All of that pretty much happened while drinking this, though it wasn't anything I couldn't manage. Then again, my PMS usually isn't the unbearable part. Only a select few times has my PMS been as bad as my period pain, but this time (thankfully) certainly wasn't one of them). I drank one tonic throughout the today as I did the day before. My hope is that drinking this tonic prior to my period will ease me into it painlessly. Today was my dads birthday. Since my mom took off the entire week (the week of the 15th is loaded with my dads birthday, mine, and my parents' anniversary), we decided to go out. I drank my tonic before we went anywhere and felt pretty good the entire day. My PMS was pretty much on the down low and the occasional cramps I get while experiencing PMS were very mild and infrequent. I actualy felt better today than I did yesterday, ironically. The taste of the tonic is even starting to grow on me, and I'm kind of sad I only have one bottle left. My biggest concern is that on the bottle, it says to drink the tonic as soon as you get PMS and the first few days of your period. What if I don't get my period tomorrow? Then what? Will it effect my results? I guess time will only tell. Woke up today feeling quite heavy and groggy. More so than usual. Finally got the strength to get my day started and what do you know? I got my period. As soon as I saw that, I went straight for a tonic. Believe it or not, this one tasted like it was sweeter than all the rest - like it had more honey in it or something. I enjoyed this bottle of tonic the most and regret that it was the last day of drinking the tonic. I wished I had more bottles. Every time I felt even a slight cramp, I reached for the tonic and took a sip. Ironically, the cramps would diminish as if on cue. For the beginning of the day, I didn't feel bad at all. In fact, I had very minimal cramps. I got some freelance work done and was able to actually focus on what I was doing, which felt great. Usually the whole first day of my period is terrible from the moment I wake up to the moment I go to sleep. It wasn't like that though. With the tonic by my side, I felt virtually pain-free. Unfortunately though, all good things must come to an end: By the middle of the day, I started feeling my cramps act up again. This time, I had no tonic. I had finished it. I tried my best to ignore the pain, because at first it was tolerable. But by 5 P.M., I had no other choice: I had to take advil. Out of seemingly nowhere, my cramps started becoming worse and worse to the point where I couldn't get comfortable, couldn't focus, couldn't function. After that, I decided to stop doing any more work and just relaxed. I had made a promise to myself at the beginning of all this to try and avoid advil like the plague while I drank these tonics. I wanted to experience their full potential. Unfortunately, as soon as I ran out of the tonic, my period pain kicked back in, full swing. I have different levels of pain during my period: Lets say 1 is extremely low pain, and 10 is extremely high pain. Usually speaking, a typical period for me ranges somewhere between a 6 and an 8. There are times when it is definitely a 10 though. Fortunately, this time around, it was more like a 6. That said, 6 is still more painful than I care for. My goal is to get the pain level down to about 3 or 4. I don't expect it to ever go down to 1 or 0, except by the late days (which was today - I finished my period for this month on November 22 and have no pain, of course). That said, I must admit that while I was still drinking the tonics, my pain level was more in my desired range of 3 - 4, which is very impressive. I wonder how things would've been, had I had more tonic available to me. I wonder what would've happened if I drank two bottles on November 16 instead of one (would I still have needed the advil at all?). These are questions I cannot answer, but I will say this: I am thankful for this experience. 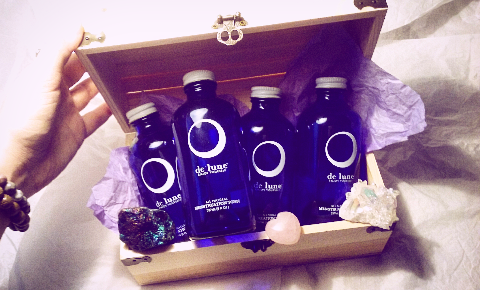 I'm thankful that De Lune Care is creating these tonics and letting women like me try them out. I am thankful that there are other women out there who realize period pain is not normal and that there needs to be natural solutions made available, not coping methods. I cannot say anything bad about De Lune Care, despite the fact I had to take advil at some point. I recommend this brand to all the women I know who have severe cramps, simply because they did help me deal with my PMS and the first day of my period. If you do decide to purchase from them, I recommend getting at least two sets: This will give you 8 bottles in total. That way, you'll have some more to drink throughout your period, depending on when you choose to start drinking them. For more information on De Lune Care, check out their Facebook, Instagram, or Twitter accounts. You can also visit their website to make your own purchase and start your De Lune experience. It's nice that you write about these things. Dangerous Dogs Act 1991 which states that pit bull terriers, Japanese Tosa, Dogo Argentino and Tila Brasileiro are too dangerous to own or breed from. the dogs aren't properly trained and aggressive behaviour may be actively encouraged by isolating the dog so that it isn't used to or comfortable with strangers. Some breeds were originally selectively bred for fighting, so have a greater tendency for aggression andCBD oil for dogs certain qualities such as a strong jaw, or they bite and don't let go for a while. Chantal Burnison is one of the most important figures of the skin care and anti aging industry. She discovered CBD gummies for sale of the most powerful ingredients that help people to firm and reduce their lines and wrinkles. She is not only a biochemist, she is also a business woman and attorney.